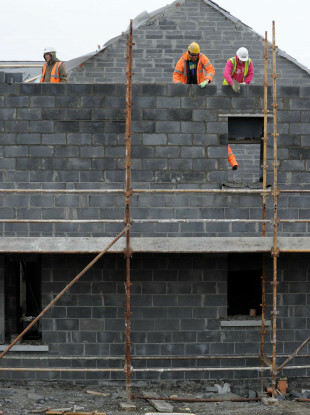 Ibec has said that at least 60,000 more builders will be needed in the upcoming years. In its latest quarterly economic outlook published today, Ibec says that 2016 figures showed that 80,000-100,000 workers would be needed to meet government construction targets but that this has not been met. Ibec says that just 26,000 have been added in the two years since and that there is not enough construction workers on the Live Register to make up the shortfall. “A further 60,000 to 80,000 workers will be needed, at a minimum, to meet demand over the coming years. At the same time, there are only 33,000 workers formerly in craft or related sectors (the best proxy for construction ready workers) on the Live Register,” the report states. This includes those already working but receiving in-work benefits. This number is down from 120,000 in 2009. In the meantime, growth in the number of non-national workers in construction over the past twelve months stood at only 3,800. This number will need to increase significantly over the coming years if we are to deliver on much-needed housing and infrastructure projects. On the completion of housing, Ibec states that initial figures estimate that 18,500 new homes were completed last year and that this will likely increase to 22,000 this year and reach 25,000 units in 2020. The report also outlines how Irish businesses are already feeling the effects of a Brexit which hasn’t happened yet. Ibec says that businesses are already spending money on “costly contingency measures” because of the lack of clarity around Brexit. Among these contingency measures are the purchase and storage of high stock levels to guard against potential problems with supply. Another cost is the declining availability of credit and capital as companies hold back on investment pending a greater understanding of what exactly will happen with Brexit. Ibec has been critical of both the Irish and British governments for not doing enough to prepare for a no-deal Brexit, something it refers to as a “cliff edge” outcome. “The major political obstacles to ratification cannot be ignored, and business, along with government and the EU, must work to avoid a ‘no deal’ cliff edge outcome,” the report states. While we note recent contingency plans published by the Irish government and European Commission, we urge them to work collectively to bring forward more meaningful measures to support business. Future iterations must provide much-needed information on how a ‘no deal’ scenario would be managed on the ground. Overall, while Ibec has forecast growth for the Irish economy of 4.9% this year, it notes that this is weaker than recent years due to a number of factors. While Brexit is one of them, Ibec also states that Ireland is at “a mature phase of the business cycle with the economy close to capacity”. Email “'Thousands of non-national construction workers will be needed to meet housing targets' - Ibec”. Feedback on “'Thousands of non-national construction workers will be needed to meet housing targets' - Ibec”.